Ironstone. A few signs of wear mainly around the rim and the foot and just a touch to the handle otherwise fine. Blue printed backstamp: Adams Member of the Wedgwood Group Real English Ironston Micratex etc. Blue Butterfly. A fabulous two handled loving cup with not only cattle, but also a horse and sheep. Lovely floral border around the inside rim and along the line of the handle. Backstamp: Adams Cattle Scenery Est 1657 England. A little very minor wear to the rim otherwise excellent condition. 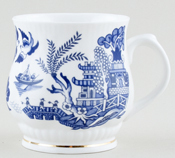 Lovely round cup, with two chinoiserie pattern vignettes either side. Backstamp: Adams England. Two handled cup with saucer. Difficult to see in the photograph, but this cup actually has two side handles. Backstamp on saucer: Rd No. 623294 This Pattern was introduced by William Adams in 1780 being a copy of a Chinese pattern & one of the first of its style produced in English Pottery Wm Adams. Different pattern cartouche either side of the cup and three to the saucer. Backstamp: On saucer Rd No 623294 This Pattern was introduced by William Adams in 1780 being a copy of a Chinese pattern & one of the first of its style produced in English Pottery Wm Adams. On cup Adams England. A little minor wear to the rim of the cup otherwise excellent condition. Funnel or Titan shape. Backstamp: Rd No. 623294 This Pattern was introduced by William Adams in 1780 being a copy of a Chinese pattern & one of the first of its style produced in English Pottery Wm Adams England. Wear to the rim and a couple of small manufacturing blemishes on the outside, overall good condition. Titian shape. Backstamp: Rd No. 623294 This Pattern was introduced by William Adams in 1780 being a copy of a Chinese pattern & one of the first of its style produced in English Pottery Wm Adams. There is wear to the rim otherwise absolutely fin. This is such a lovely shape of cup with gently flared rim. Excellent condition. Blue printed backstamp Adams England. Lovely round cup and saucer with two chinoiserie vignettes either side of the cup and three to the saucer. Backstamp: On saucer Rd No 623294 This Pattern was introduced by William Adams in 1780 being a copy of a Chinese pattern & one of the first of its style produced in English Pottery Wm Adams. On cup Adams England. A little minor wear overall excellent condition. Funnel or Titan shape. Backstamp: Chinese Bird Rd No. 623294 This Pattern was introduced by William Adams in 1780 being a copy of a Chinese pattern & one of the first of its style produced in English Pottery Wm Adams England. Light crazing with a little wear underneath and some inky smudges inside overall excellent condition. Large cup and saucer. Backstamp: Adams England on cup and on saucer Rd No 623294 This Pattern was introduced by William Adams in 1780 being a copy of a Chinese pattern & one of the first of its style produced in English Pottery Wm Adams. A little minor wear, overall excellent condition. Depth of colour varies just a little from piece to piece. Funnel or Titan shape. Backstamp: Rd No. 623294 This Pattern was introduced by William Adams in 1780 being a copy of a Chinese pattern & one of the first of its style produced in English Pottery Wm Adams England. Has a small minor manufacturing fault otherwise excellent condition. Funnel or Titan shape. Backstamp: Rd No. 623294 This Pattern was introduced by William Adams in 1780 being a copy of a Chinese pattern & one of the first of its style produced in English Pottery Wm Adams England. A couple of small blemishes inside and minor wear to the rim otherwise excellent condition. An unusual piece in Chinese Bird. A taperering cylindrical vessel with no handle. Backstamp: Rd No. 623294 This Pattern was introduced by William Adams in 1780 being a copy of a Chinese pattern & one of the first of its style produced in English Pottery Wm Adams England. Crazed with a little wear around the foot otherwise absolutely fine. With ochre rims. The small cup is crazed with just a touch of staining inside to the base and a little to the handle. The ochre rim to the cup has minor wear. Saucer is fine. Lovely straight sided mug. Backstamp: Rd No 623294 This pattern was introduced by William Adams in 1780 being a copy of a Chinese pattern & one of the first of its style produced in English pottery Wm Adams England and impressed Adams. Light crazing otherwise excellent condition. Large Funnel or Titan type mug. Backstamp: Rd No. 623294 This Pattern was introduced by William Adams in 1780 being a copy of a Chinese pattern & one of the first of its style produced in English Pottery Wm Adams and impressed Adams Tunstall. Excellent condition. This is a lovely large mug or tankard. It has two different scenes either side. There is a touch of discolouration to the handle and minor wear to the rim otherwise excellent condition. This is a wonderful piece, a straight sided tankard with a fabulous entwined strap handle. Embossed flowers decorate the join of the handle to the tankard, which has a different cartouche either side of the body. Backstamp: Rd No 623294 This pattern was introduced by William Adams in 1780 being a copy of a Chinese pattern & one of the first of its style produced in English pottery Wm Adams. Unusual piece in lovely condition. There are one to two lines of light crazing but these really are minor. Different pattern cartouche either side of the cup. Lovely large mug with a lovely romantic scene either side of the body and pretty floral border to the inside rim and along the line of the handle. Light all over crazing and some wear to the rim but overall in superb condition for a tankard of this age. No makers marks but almost certainly Adams Columbia. A flow blue pattern, Doric appears to be previously unrecorded. Adams backstamp for 1892-1917. Delightful little cup and saucer. Pretty flower border inside the cup and along the line of the handle. One saucer has a small firing fault on the back otherwise excellent. Saucer slightly darker blue than the cup. Black and blue printed backstamp. Very pretty! Depth of colour varies a little from piece to piece. Excellent condition. Black printed backstamp. This is the later version of Adams popular Cattle Scenery where the cows are replaced by horses! Excellent condition. This is such fun! A huge cup - ideal for that first drink of the day. 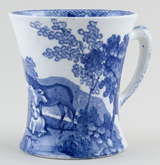 The view on the cup is more reminiscent of the original Cattle Scenery that this pattern succeeded, with cattle in as well as horses. Saucer varies in depth of colour. Blue and black printed backstamp. Backstamp: Landscape Adams Est 1657 England. Minor signs of wear, but overall excellent condition. Light crazing to the glaze on the saucers and one cup appears to have one line of crazing inside, otherwise excellent condition. Typical blue printed backstamp. 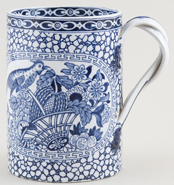 Lovely mug printed in a mid shade of blue. Backstamp: Warranted Staffordshire W A & Sons England. A little wear to the rim otherwise excellent condition. Bone china with gilt. A gorgeous little cup and saucer with pretty flow blue floral design and gilt spatter decoration. There is a little wear to the gilt on the handle otherwise superb. Samuel Alcock. An absolutely gorgeous cup and saucer, blue printed under the glaze with hand applied enamel colour and gilt rim. The cup is beautifully decorated both inside and out. There is a little minor wear to the gilt otherwise both pieces in excellent condition. Blue printed Carlton S A & Co on the saucer, with pattern No. 9629 in script on both cup and saucer. Small cup and saucer in this wonderful pattern. Backstamp: Punch C Allerton & Sons England. The cup has light crazing and minor wear to the rim. Overall excellent. This is a delightful little cup/mug. Light crazing otherwise absolutely fine. Blue printed backstamp Allertons Made in England. Bone china with gilt. Backstamp: Ashely Fine Bone China Staffordshire Made in England. Excellent condition. 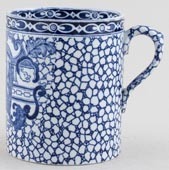 A really lovely mug with lovely border pattern around the inside rim and floral detail along the line of the handle. This pattern also known as Ancient Ruins. Backstamp: Ashworth Bros Hanley England. Excellent condition. This is a delight! A small rich cobalt blue cup and saucer, the cup in a hallmarked silver holder. Backstamp: Aynesley England and hallmarks on holder for Sheffield 1925. A touch of wear to the gilt rims otherwise excellent condition. This is a delight! A small bone china yellow, white and black cup and saucer, the cup in a hallmarked silver holder. Backstamp: Aynesley England and in script on the saucer 3567 N. Hallmarks on holder for Sheffield 1925. A little minor wear under the saucer otherwise excellent condition.